Spiral E-News The Latest in Photo Finishing, Binding, Laminating, Cutting, Shredding, Shrink Wrapping for Paper! 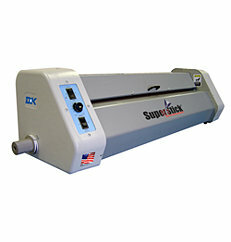 The EXP 42 Pouch Mounter Laminator is the state of the art print finishing system. This machine can mount and laminate your printed material with desired results every time. Since the EXP 42 is only 57” x 16” x 15” it is designed to sit on any work table, cart, or desktop for easy access. This 42 inch pouch laminator easily mounts and laminates documents in common format sizes such as 24” x 36” and 36” x 48” up to 3 feet per minute. The EXP 42 Pouch Laminator combined with our revolutionary SuperStick Laminates will give your printed material the highest quality finish that cannot be matched with any other machine. The adjustable roller temperature and pressure settings allows for ideal laminating and mounting, which makes it easy to use with little training required. The EXP 42 Pouch Mounter Laminator features a reverse mode which allows for easy misfeed correction. This simple and easy to operate laminator requires very low maintenance making it the perfect fit for startup finishing ventures, corporate in-house facilities, framing shops and review bureaus. If you have any questions or are interested in the EXP 42 Pouch Mounter Laminator , visit us at SpiralBinding.com. We have great pricing on a full line of Wide Format Mounter Laminators. Call us at 1-800-631-3572 for more information! PRINT 18 is almost here! Grab Your FREE Exhibits Pass Now! Copyright Spiral (Spiral Binding LLC). All Rights Reserved.